valid from March 15 to May 31, 2019. Conditions and limitations apply. Visit www.mycertifi edservice.ca for program details. Maximum 2 sets (8 tires) per VIN. This offer is nontransferable. Conditions apply. Subject to credit approval. No rain checks available. Accounts must be in good standing to be eligible for offer. Offer valid only on purchases charged to the Account (less any credits, refunds or returns). This offer may be changed, cancelled or extended at any time without notice. Instant Discount applies to select individuals who are current Scotiabank® GM®* Visa* Cardholders. 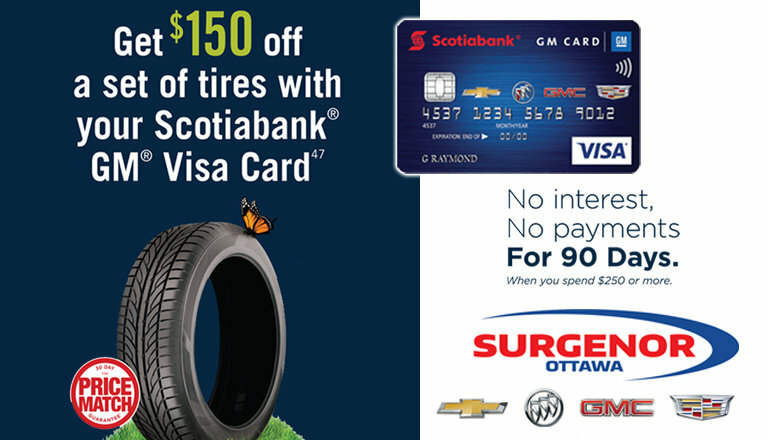 TIRE 30-DAY PRICE MAT CH GUARANTEE: Surgenor Barrhaven Chevrolet-Buick-GMC will match the competition’s prices. If you purchase one of the aftermarket tire brands listed below and later find a better price on a qualifying brand within 30 days of the purchase, we’ll refund the difference. Tire Brands BFGOODRICH, BRIDGESTONE, CONTINENTAL, DUNLOP, FIRESTONE, GENERAL, GOODYEAR, HANKOOK, KELLY, MICHELIN, PIRELLI, UNIROYAL, KUMHO. The price match applies to the brands listed above. Tire brands not carried by Surgenor Barrhaven will not be guaranteed for a price match. Competitive Prices The competitive price you find must be in a valid ad, written estimate or Internet quote for identical, new tires. The tires must be an exact match in brand, tire line, size, load rating and speed rating to be eligible for the price match guarantee. All competitive quotes (including internet quotes) must come from a local competing tire retailer and installer (with a physical location within 100 km of Surgenor Barrhaven. The competitive price must be valid within 30 days of your purchase of any of the tire brands listed above. Service and Installation The price match guarantee is only valid on the tire price and does not include installation/labour. Offer available to retail customers at Surgenor Barrhaven. Offer valid from January 1, 2019 to December 31, 2019. GM Canada reserves the right to cancel, modify or amend the offer without notice. Conditions and limitations apply. May not be combined with other offers and programs. Special 90-Day No Interest, No Payment Purchase Financing Offer and the Scotiabank GM Visa Credit Card Account: (the “Account”) This 90-Day No Interest, No Payment purchase offer (the “Financing Offer”) is available on the Account on new purchases of $250 or more (after taxes) made at Surgenor Barrhaven starting October 21, 2017. No payments are required on the amount of the promotional purchase (the “promotional balance”) under this Financing Offer during the 90-day promotional period. Maximum of 6 Financing Offers can be on the Account at any one time. If you make a product, parts or service purchase at a GM Canada dealership and already have 6 Financing Offers on your Account, that purchase will be treated as a regular purchase. You must pay the promotional balance in full by the promotional end date to avoid any interest on that balance. After the promotional period ends, any remaining promotional balance is then charged interest at the interest rate that then applies to purchases on your Account (“Purchase Rate”). The annual interest rates on the Account are currently: 19.99% on purchases (17.99% until September 30, 2018 for Scotiabank GM Visa Card) and 22.99% on cash advances (including balance transfers, Scotia Credit Card Cheques and Cash-Like Transactions). Annual fee is $79 for the Scotiabank GM Visa Infinite Account and $0 on the Scotiabank GM Visa Account. If you do not make your Minimum Payment each month, the Financing Offer may be terminated by us. The Financing Offer will immediately end and your Purchase Rate will increase to 24.99% on purchases, including any balance remaining that is subject to this Financing Offer, for at least 12 months starting with your next statement if, including during the promotional period you miss making 2 minimum payments on time in any 12 month period. At the end of the promotional period, any remaining promotional balance will form part of the New Balance on your Account and will form part of the Minimum Payment you must pay each month. The Revolving Credit Agreement will continue to apply to this Financing Offer. Financing Offer and all rates and fees on the Account are subject to change. The Bank of Nova Scotia is not responsible for any purchases (including warranties) made by you at your GM Canada dealership relating to this Financing Offer. ® Registered trademarks of The Bank of Nova Scotia. *Visa Int./Licensed User. ®* Registered trademark of General Motors LLC. The Bank of Nova Scotia is an authorized user of General Motors LLC marks.